Public fascination with Mars has increased ever since NASA launched its unmanned rover Curiosity, which continually sends back images of the Martian landscape. Once thought to be too hostile to support life, the discovery of liquid water alters our understanding not only of the origins of the red planet but in the future potential for an eventual human presence on Mars. “It changes everything,” said Kaku, “It means that this liquid water can be used for, perhaps, irrigation, drinking water, and even rocket fuel.” WATCH NOW! 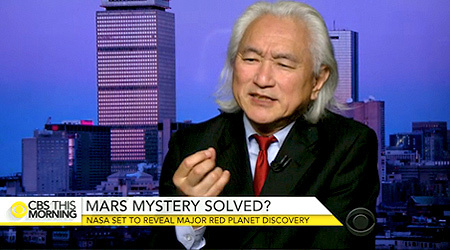 Dr. Kaku visits with the quick and quirky Kennedy on FOX Business to discuss more about NASA‘s historic discovery of liquid water on planet Mars. WATCH NOW!